I think we found our signature cookie here, folks. Don’t be scared. Yes, they contain chickpeas; quite a few of them actually. But they also contain chocolate and happen to be incredible….I promise (I have plenty of taste testers that can vouch for them)! The recipe is inspired by Hummusapien. It’s not a conventional cookie (clearly), in that the texture is much smoother and creamier (alas, why we decided to call them cookie dough cookies). 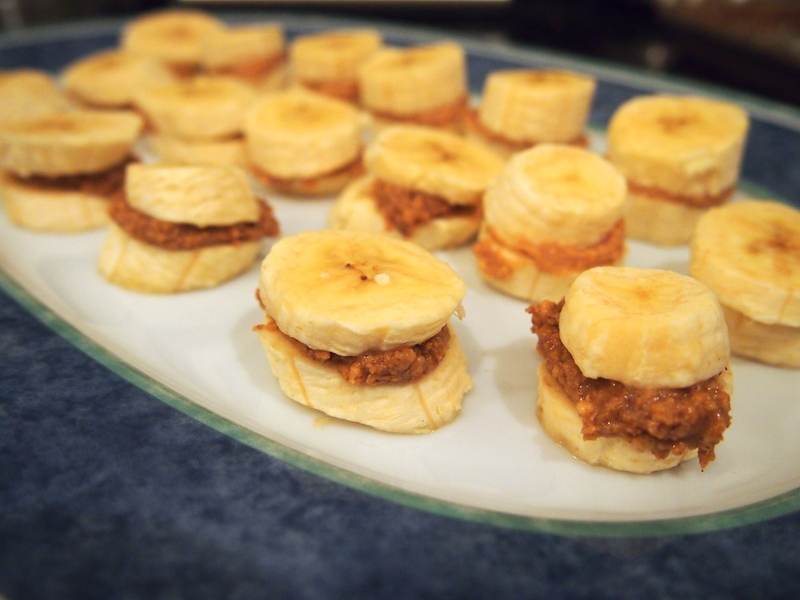 If you don’t like banana, these probably aren’t for you, since the banana flavor is quite dominant. Otherwise, check out this amazingly easy and quick recipe below and get to work! I wanted to use dark chocolate chips, but since I didn’t have any, I crushed up an Alter Eco Dark Quinoa bar that I had in the pantry. Best decision ever. I’ve made these cookies a few times now, and have had lots of fun playing around with different flavored dark chocolate bars (Alter Eco’s sea salt dark chocolate is also a great one). 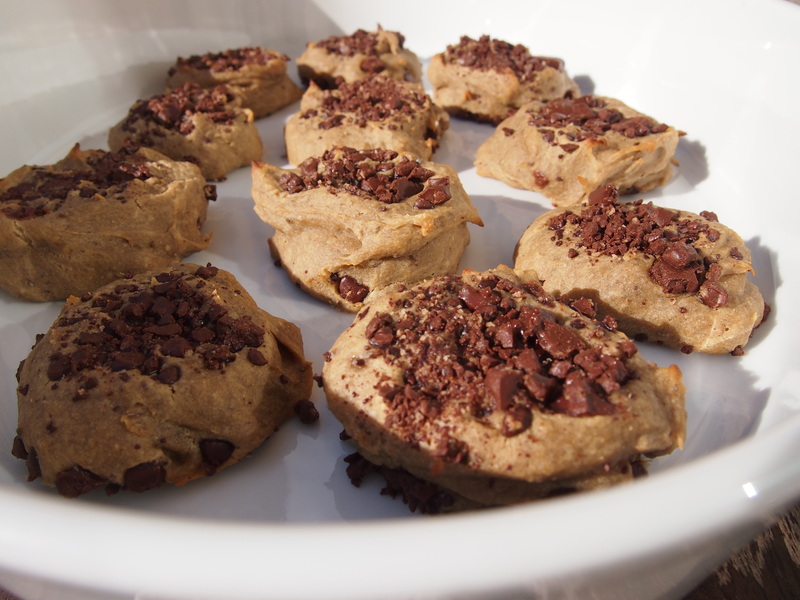 These cookies make for the perfect dessert or snack on-the-go! Honey is the only added sweetener, and you can certainly use less (especially if you have a really overripe banana). The chickpeas add protein and fiber, cashew butter supplies healthy unsaturated fats and antioxidants (thumbs up for heart health) and the chocolate induces prolonged happiness (at least, in our family). Basically, this is one of the world’s greatest “cookies.” So what are you waiting for? Preheat oven to 350F. Spray a baking sheet with cooking spray or line it with parchment paper and set aside. 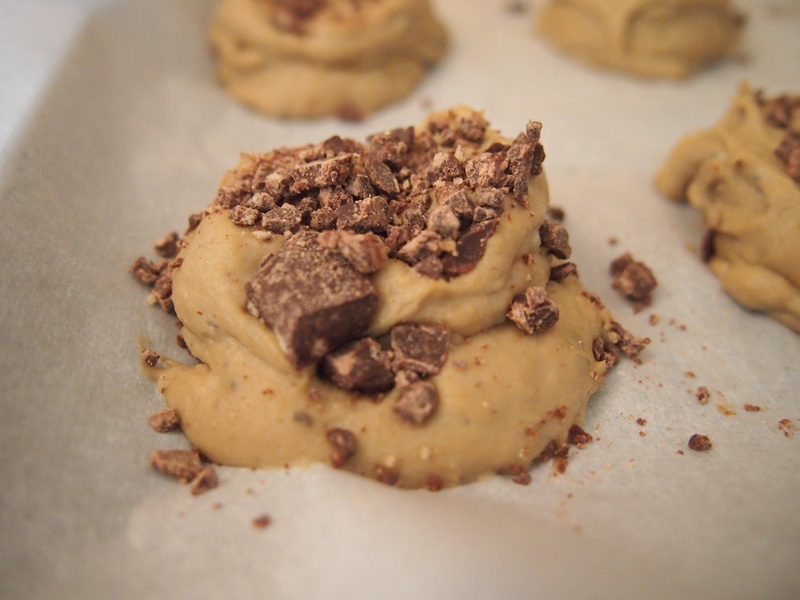 Place all ingredients into food processor (except the chocolate). Process the ingredients for two minutes, or until the batter is smooth. Store cooled cookies in refrigerator! This recipe is too delicious not to share. It’s inspired by Bon Appétit Magazine. 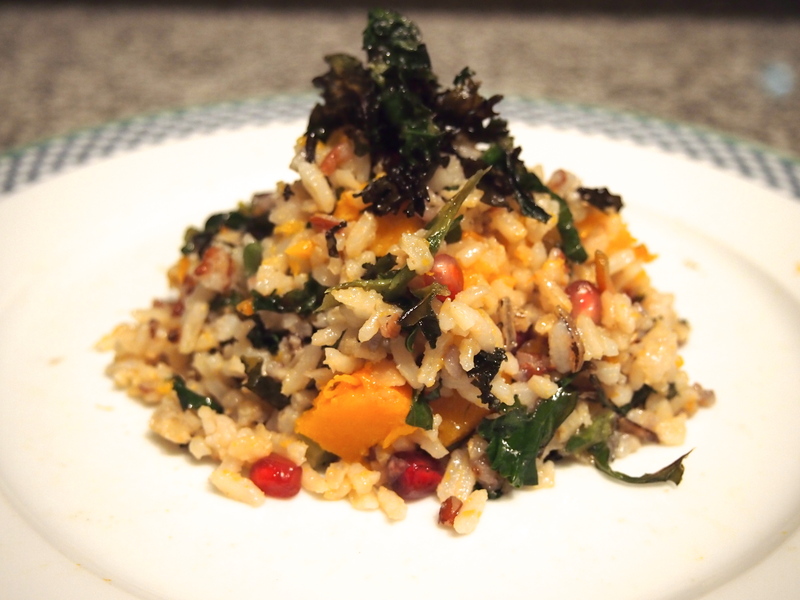 Easy, flavorful and packed with nutrients, this is a great dish all around. It’s an excellent source of Vitamin A (60% RDA*), which helps with vision, reproduction and immune function. It’s also high in Vitamin C (40% RDA*), an antioxidant that prevents cell damage, improves the immune system and facilitates with iron absorption. Manganese, Vitamin B6, Magnesium, Niacin, Phosphorus and Zinc are also plentiful in this mouth-watering dish. Preheat oven to 450°. Cook rice in a large pot of boiling, salted water until tender (~35–40 minutes); drain and rinse, shaking off as much water as possible. 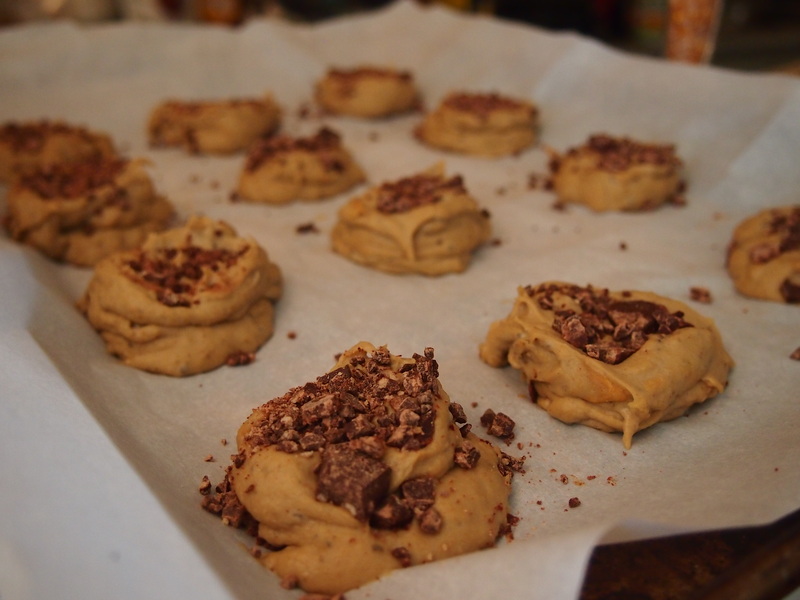 Spread out on a rimmed baking sheet and let cool. Toss squash with ¼ cup oil and place spread out on a baking sheet; season with salt and pepper. Roast, tossing once, until golden brown and tender (~20–25 minutes). Toss kale (make sure it is dry) with 1 tablespoon of oil and place spread out on a different baking sheet; season with salt and pepper. Roast, tossing once or twice until the leaves are crispy (~2-5 minutes). Whisk vinegar, honey, and remaining ¼ cup oil in a large bowl. Add black rice and wild rice, squash, scallions, pomegranate seeds and pistachios; season with salt and pepper and toss to combine. Sprinkle the roasted kale on top when ready to serve. *Recommended Dietary Allowance (RDA) is the average daily level of intake sufficient to meet the nutrient requirements of nearly all (97%–98%) healthy individuals. What’s a Whole Grain Anyway? Whole wheat, whole grain, enriched, refined…what does it all mean? The basics: The grain kernel is composed of the germ, bran and endosperm (see photo below). This is how the kernels are naturally found when harvested and reaped. The Germ contains essential fatty acids, vitamin E, B vitamins, magnesium, folate and some protein. The Bran is rich in fiber (responsible for brown color of whole grain), B vitamins, minerals and antioxidants. The Endosperm contains mostly starch, with trace amounts of oils and protein. Helps improve bowel health and promotes the growth of healthy bacteria in the colon, which may reduce the risk of stomach and intestinal cancers. In order to receive these health benefits you have to make sure the products you are consuming contain the grain kernel in its original form (with the germ, bran and endosperm intact). Unfortunately, this isn’t as simple as you would think. It’s easy to get confused when shopping at the grocery store nowadays with the endless numbers of products, deceiving marketing tactics and unrecognizable ingredient lists. More importantly, be wary of refined grains and enriched flour that all too frequently find their way into a vast majority of our food. In an effort to increase the shelf life of products, manufacturers often process wheat through a refining method, by stripping the kernel of the germ and bran. This results in white, refined wheat. This means that the wheat is stripped of the nutrients mentioned above, namely the fiber and healthy fats. Enriched flour means that the nutrients and vitamins stripped during the refining process are added back in. Unfortunately, enriched flours don’t have the same nutritional benefits as whole-wheat flours. For starters, less fiber is present, causing blood sugar spikes. Key nutrients are also left out. Additionally, a different form of iron is added back in that is not as bioavailable as the form found in whole wheat alternatives. In general, refined grains and enriched flours are metabolized much quicker and increase blood sugar more rapidly than their whole grain counterparts. They have been associated with increasing cholesterol and inflammation in the body as well. How to distinguish if a product is made with whole-grains…ONLY! First things first….forget the marketing claims on the packages of the foods you are purchasing. Just because they claim to be “100% whole grain,” “whole wheat,” “multigrain,” or “stone ground” doesn’t guarantee that you will be consuming a truly whole grain product. In fact, many of these products are composed mostly of refined flours, with marginal amounts of whole grains. Some manufacturers even color their products brown with molasses or caramel color to give the illusion of whole grains. BOTTOM LINE: Skip straight to the ingredient lists, which will indicate if it is, in fact, a whole grain product. *Whole white wheat is a whole grain, despite the white color. It has many of the nutritional advantages of traditional whole wheat, but with lighter color, milder taste and softer texture. A good rule of thumb is to look for the word WHOLE preceding the grain. 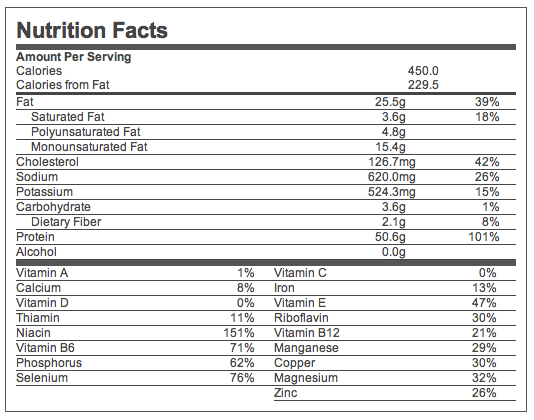 Note: Those grains listed above without the term “whole”, refer to grains that are very rarely made in processed form. Many products use a combination of grains or flours, so it’s important to check the whole list of ingredients. Aim to make half the grains you consume daily to be whole grains as recommended by The 2010 USDA Dietary Guidelines. Don’t like the taste of whole wheat bread or brown rice? Give white whole wheat bread a try and explore some of the other grains mentioned above. We did some investigating and discovered that the following products are not actually 100% whole grain. Busted!!! Be your own detective and don’t be fooled my tricky marketing tactics! Read more on whole grains at the Whole Grains Council website. Great question. So what is the deal with stevia? It’s marketed as a “natural”, zero-calorie sweetener and is derived from the yerba dulce shrub grown in Brazil, Southeast Asia and Paraguay. The two main sweet tasting components of stevia are rebaudioside A (rebiana aka reb A) and stevioside, which are about 200 times sweeter than sugar. So being that stevia is derived from a plant, it must be the ultimate sugar substitute, right? Well…not so fast…. To produce reb A commercially, stevia plants are put through a water extraction process and dried. The resulting extract contains about 50% reb A. In order to completely isolate the reb A, ethanol or methanol are used as a solvent to allow separation through crystallization. Keep in mind that this process creates a very concentrated product, which means that it is no longer in its original and natural form. In the digestive tract, reb A is metabolized and broken down into stevioside. The stevioside is then further broken down into glucose and steviol. The glucose released in this process is used by bacteria in the colon, preventing it from being absorbed into the blood stream (for this reason the product also has negligible effects on blood sugar). Steviol cannot be further digested and is passed from the digestive system in urine or feces. Because the breakdown products are not absorbed, reb A and stevioside do not contribute any calories. High dosages of reb A fed to rats reduced sperm production and increased cell proliferation in their testicles; however, another study using rats and humans demonstrated lack of reproductive toxicity. Pregnant hamsters that had been fed large amounts of steviol (a stevioside derivative) had fewer and smaller offspring. In the laboratory, steviol can be converted into a mutagenic compound – if cell DNA becomes mutagenic, cancer may ensue. Overall, strong randomized, controlled trials are lacking and more research is needed. Traditionally, Guarani Indians in Paraguay consumed stevia leaf extracts as an oral contraceptive. In 2008, stevia was deemed GRAS (generally recognized as safe); if an ingredient is GRAS, it can be used without a pre-market review or FDA approval. * Hundreds of different chemicals can be used to produce “natural flavors.” Because companies are not required to identity these artificial (and natural) flavorings, there is no way of knowing exactly what ingredients are being used. Comforting, huh? Using stevia sparingly is more than likely OK, but the truth is, we just don’t know enough. More comprehensive research is most certainly needed. If you do choose to use stevia, opt for pure stevia plant extract as opposed to products that contain other additives and colorings (like TruVia & PureVia). The World Health Organization’s Joint Experts Committee on Food Additives has approved an acceptable daily intake of steviol glycoside (stevioside or reb A) of up to 4 mg per Kilogram of body weight. This equates to 2-3 packets containing ~100mg of Stevia (see individual packaging for exact amounts) for a person who weighs 150lbs. It’s important to be your own detective and do research before consuming a new product, especially since we know product marketing can be deceiving. And just because it’s labeled “natural” doesn’t mean it’s safe or void of other unnatural additives. Always look at the facts and make educated decisions on what you decide to put in your body. Looking for an alternative to stevia to sweeten your tea? I love good old-fashioned, natural honey. One teaspoon will only run you about 21 calories + 6 grams of carbohydrates and it’s packed with antioxidants, antiseptic and antibacterial properties, not to mention a handful of enzymes, amino acids, vitamins and minerals. We will touch on the topic of natural and artificial sweeteners more in the future! P.S. Please send in your questions to Melissa@chickpeasandchocolate.com and they may be selected for a future post! Carakostas, M. C., Curry, L. L., Boileau, A. C., & Brusick, D. J. (2008). Overview: the history, technical function and safety of rebaudioside A, a naturally occurring steviol glycoside, for use in food and beverages. Food and Chemical Toxicology, 46(7), S1-S10. Curry, L.L, Roberts, A., Brown, N. (2008). Subchronic toxicity of rebaudioside A. Food Chem. Toxicol., 46 (7), S11-S20. Make a coarse paste with almonds, garlic, salt, paprika and olive oil in a food processor or blender. Roast at 425 degrees in the oven until cooked through, 15 to 18 minutes. Serve whole or sliced with steamed spinach, kale or veggie of your choice. The recipe also goes well with a side of couscous, whole-wheat pasta, brown rice or quinoa. Think ahead and make extra for the week to use on top of salads or pasta. So easy… so delicious. This chicken recipe is a great source of protein, monounsaturated fats, niacin (aids in protein, carbohydrate and fat metabolism), B6 (aids in protein metabolism) and selenium (antioxidant). 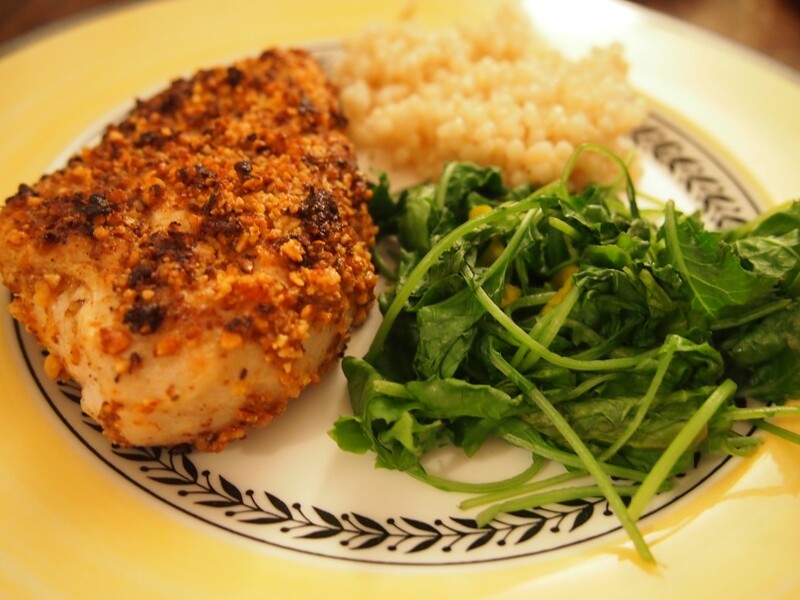 Last night we made the chicken with steamed kale and whole-wheat couscous (pictured above). I’m confident you’ll love this chicken as much as I do! The recipe is inspired by Wholeliving.com. 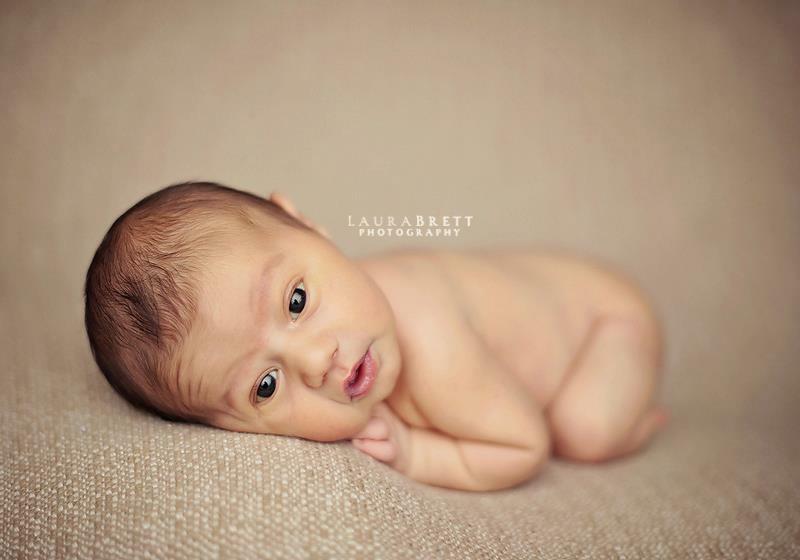 I just returned from Atlanta, Georgia where I was visiting family and celebrating the birth of my new cousin, Jacob Saul (Photo Credit: Laura Brett Photography). 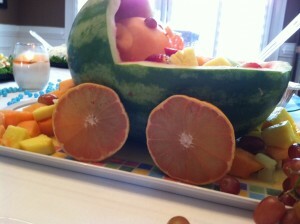 Check out this centerpiece I made for his “bris” (Yiddush for “covenant of circumcision”). For those who don’t know, a bris is a Jewish religious male circumcision ceremony performed on 8–day old male infants. 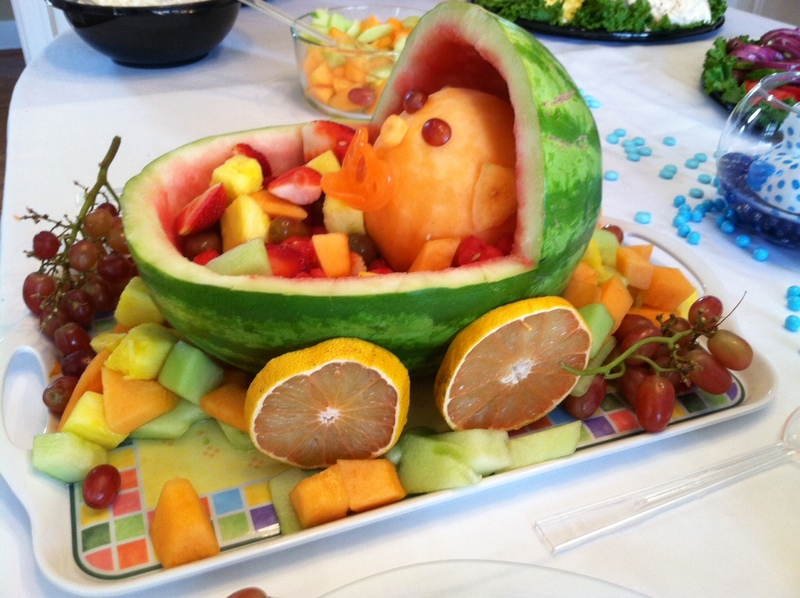 Not so fun for the baby, but as with most Jewish holidays and celebrations, the “deed” is followed by an elaborate meal. I found my inspiration for this centerpiece on Pinterest and made some changes as I went along. This is a great idea for a baby shower or baby naming as well! 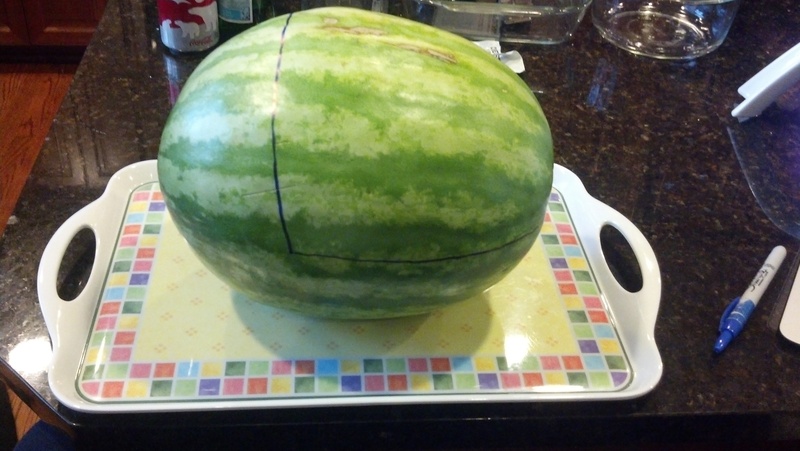 Step 1: Using a permanent marker, outline the watermelon to mark the areas that will be carved out. I used a piece of paper as a guide to help keep the lines straight. Step 2: Using a combination of a sharp knife, melon baller or spoon, carve out the entire inside of the watermelon. 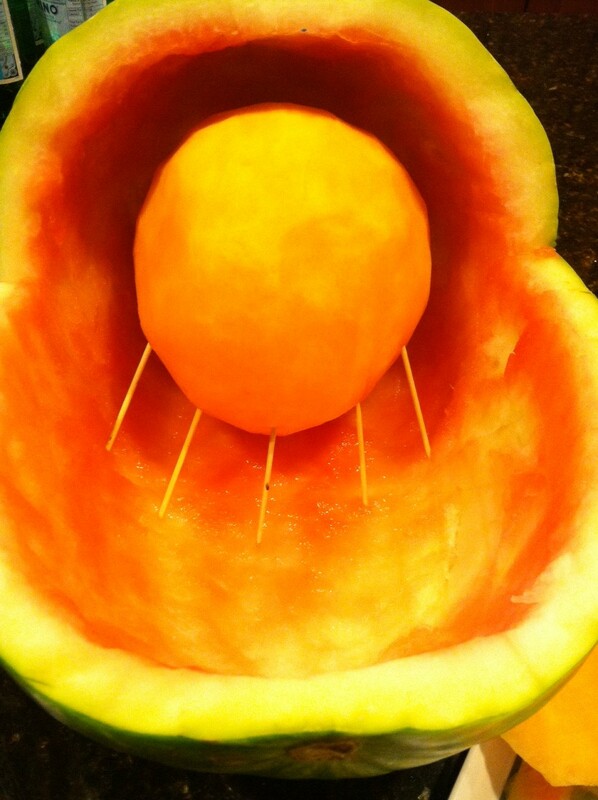 Step 3: Remove the skin of the cantaloupe and use a peeler to scale down to a good, rounded “head size”- Then fasten the head with toothpicks to the bottom of the watermelon. 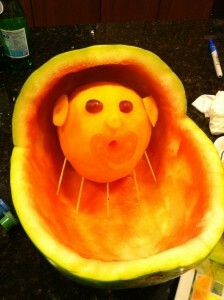 Step 4: Using toothpicks, fasten grape slices for the eyes and scrap cantaloupe pieces for the ears and nose. Then use a knife to carve a hole for the mouth and insert the pacifier. Step 5: Fasten 4 slices of grapefruit (close in size) to the outside of the watermelon using toothpicks to create the illusion of wheels. 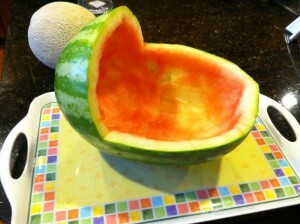 Step 6: Fill the watermelon with cut up/balled fruit of your choice. 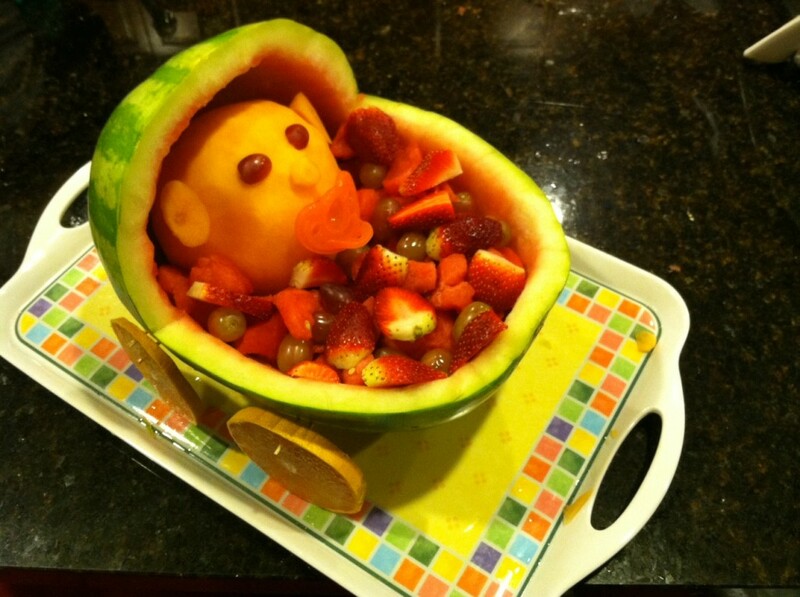 Right before serving to guests, fill the rest of the tray with an assortment of cut up fruit. Keep extra on the side and replenish as needed. Step 7: I put baby Jake’s monogram on the backside of the watermelon with a permanent marker and paint for some extra personalization. 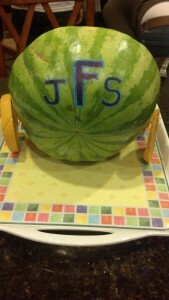 This watermelon was a big hit and didn’t take long to make. Feel free to use a variety of different fruits and experiment to see what creative add-ons or substitutions you can come up with. Please share any fun ideas you may have or any other types of food centerpieces you have experimented with in the past. Happy Holidays from Chickpeas & Chocolate! Enjoy this time with family, friends and GOOD FOOD. Remember it’s a holiDAY – Just because there are numerous holiday parties and celebrations from Thanksgiving through New Years, doesn’t mean it’s a free for all. Let loose and enjoy your favorite foods on Thanksgiving, Christmas, New Years, and one day of Hanukah or Kwanzaa and then get back on track the next day. One day of overindulgence isn’t the problem; it’s weeks of poor eating, drinking and lack of exercise that lead to setbacks. There’s no need for restriction – On the holidays themselves, eat the specialty foods that you look forward to all year. It would be cruel to deprive yourself of latkes, eggnog, stuffing, gravy and other holiday-specific delicacies. Instead, steer clear of fried foods, heavy pasta dishes and rich desserts that you have access to year-round. Use the Plate Method as a guide – During holiday celebrations with friends, family and work use the plate method as a guide to stay on track. Fill ½ your plate with veggies/salad, ¼ of your plate with starchy items, and ¼ with protein – This method is the perfect way to stay in check. Click here for a great example of the “My Plate” Method from nyc.gov. Watch the alcohol intake – Alcohol contributes seven calories per gram, which is almost as much as fat. This doesn’t account for mixers and juices that are typically added to cocktails. And let’s be honest, once we get a few drinks in us, the late night munchies are almost inevitable. And what about that “hangover breakfast” you crave that is filled with fat-laden breakfast potatoes and oily/fried foods? Basically, drinking can really sabotage your plans to stay healthy during the holiday season. Keep in mind that dehydration can mimic hunger, so it’s important to stay hydrated. Try drinking a glass of water in between alcoholic beverages. I love adding seltzer to some white wine for a refreshing spritzer; this provides less alcohol and fewer calories. The Dietary Guidelines for Americans defines moderate drinking as up to one drink per day for women and up to two drinks for men. Note, one drink equates to 12oz of beer, 5oz of wine, and 1.5oz of 80-proof distilled spirits (gin, whiskey, vodka, etc). 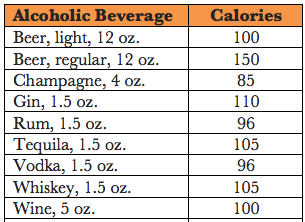 See chart below, which breaks down caloric content of various types of alcohol. Give yourself a weekly limit and stick to it! Slow down – When has there ever been a shortage of food or drinks at holiday events? Eat and drink slowly and allow your brain to catch up to your stomach. Step away from the food table – Take your conversations away from the food table – it’s hard to stop eating when it’s right in front of you! Eat REAL food – As always, avoid processed baked goods and foods with artificial colorings, artificial flavors and preservatives that definitely don’t hold a dime next to the delicious homemade items. They are not worth the chemicals, calories or stomach space! Don’t skip meals – It may seem like a good idea to cut back and eat less during the day so that you can indulge at a party later, but this typically backfires. First off, your body needs fuel so don’t deprive it. Secondly, if you show up starving you’re more likely to overeat. Third, if you start drinking on an empty stomach you are going to be “that guy.” Before going to your umpteenth holiday party make sure to have a snack. Walk it off – There’s nothing better than a good meal surrounded by the people you love. Instead of collapsing onto the couch with your guests after dinner, suggest a short walk [or if it’s the right crowd, put on some music and have a dance party]. Exercise is not only great for your overall health, but also can be extremely helpful for stress relief during the holiday season. Plan fun activities with your friends to stay active and motivated: go for a walk/run, bike ride, ice skating, rock climbing, take a dance/zumba class or hit the gym – whatever you like… just move that body. Just because it’s free doesn’t mean you have to eat it – Let’s face it, it’s nearly impossible to turn down a free ice cream sample on the street (or any type of free food sample for that matter); it’s exciting and unexpected. But, if we all ate everything that was offered to us during the holiday season we would undoubtedly have a fight with our scale…and pants. There is usually tons of free food displayed in the workplace throughout the holidays and the combination of stress, boredom and hunger make it easy to turn to the convenient and FREE food table. 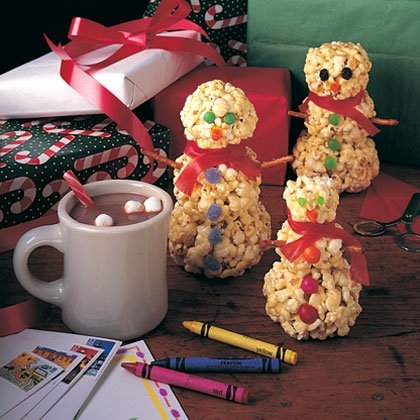 Make sure to stock your desk with some healthy snacks so you don’t fall prey to those holiday calorie traps. Some of my personal favorites are nuts, granola, rice cakes and peanut butter, fresh fruit and dark chocolate. If you are going to select something from the spread of free treats at the office, choose a small piece of chocolate that you can savor and enjoy. Welcome to Chickpeas & Chocolate! This blog will provide a wealth of information on nutrition news, product recommendations, recipes, tips and more. Be sure to browse through the website for more information about the practice. To subscribe and receive email notifications when there is a new blog post, sign up on the right! It’s certainly not the first time you’ve heard the expression, “Breakfast is the most important meal of the day”. But is there truth behind this well-known saying? Research shows that those who eat breakfast tend to have a healthier body weight, higher intake of nutrients and better signs of cognitive performance than those who skip breakfast. Additionally, skipping breakfast has been linked to increased appetite later in the day, which can result in overeating, weight gain and metabolic and hormonal changes. Bottom Line? Don’t skip breakfast! This meal is extremely important and part of an overall healthy lifestyle. Skipping meals in general is never a good idea. Our body uses food for fuel and it needs a steady stream of calories and nutrients to function properly. Aim for breakfast items complete with whole grains and protein, which have been shown to keep you feeling full and satisfied, longer. 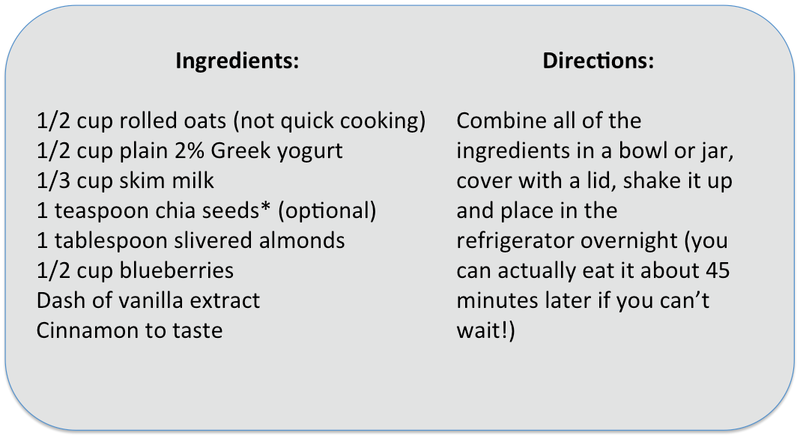 Try one of my favorite breakfast recipes that takes less than 5 minutes to prepare: Overnight, No-Cook Oatmeal – Easy, delicious and quick for those who are on the run. It is inspired by pepperlynn.com and theyummylife.com. Good source of (>25% daily recommended dietary allowance) B12, Calcium, Copper, Magnesium, Manganese, Pantothenic acid (B5), Phosphorus, Riboflavin (B2), Selenium, Thiamin (B1), Zinc. 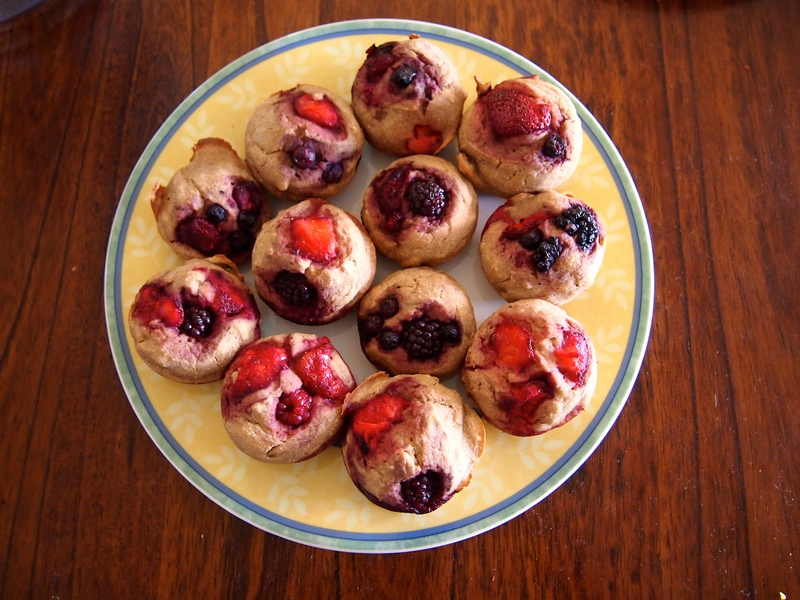 This recipe is also a good source of fiber (9 grams!) and Omega 3 fatty acids. *What the heck is a Chia seed? Chia is an edible seed that is part of the Mint family. They are a rich source of fiber, omega 3 fatty acids and antioxidants. When combined with water, they expand and form a gel, which has been shown to help control blood sugar. Try adding to cereals, yogurt, smoothies or flour when baking. Rampersaud, G. C., Pereira, M. A., Girard, B. L., Adams, J., & Metzl, J. D. (2005). Breakfast habits, nutritional status, body weight, and academic performance in children and adolescents. Journal of the American Dietetic Association, 105,743–760. Giovannini, M., Agnosti, C., & Dhamir, R. (2010). Do we all eat breakfast and is it important. Critical Reviews in Food Science and Nutrition, 50, 97–99.